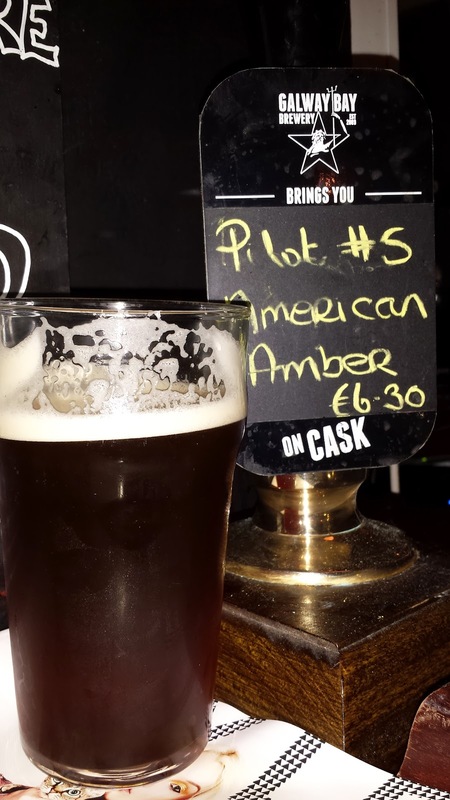 It seems to have taken me a while but I finally had a chance to sample the Galway Bay American Amber and it was on cask, apparently a rarity. First off, the beer is outstanding as I have come to expect from Galway Bay. You can read TheBeerNut's thoughts if you want to know more about the kegged beer but I suspect it was a lot better on cask. It was €6.30 for a pint (it's 7.4%) but they wouldn't take my Beoir voucher for .50c off "because of the cask premium". That didn't bother me as I can use the vouchers for plenty of other beers but it got me thinking. Why is there a premium put on cask beer in Ireland? In my experience, whenever I am in the UK I always notice just how much cheaper cask ale is compared to keg. In some cases, that difference might be influenced by fact that your average cask ale has a lower ABV so it costs less to make but that can't account for all of it. Here is perhaps the best example of the price disparity. The above image was taken a few weeks ago at The Hanging Bat in Edinburgh. It was during a Tiny Rebel tap takeover. Everything on the left is cask and the rest is keg. Many of the cask beers are duplicated on keg. They are the same ABV so that doesn't come in to it. Taking an example, Fubar is 4.4% and on cask it costs £2.40 but the kegged version is £3.40? Go ahead and click the image to see it full size. This shows that cask beer is typically cheaper in the UK but why is that? 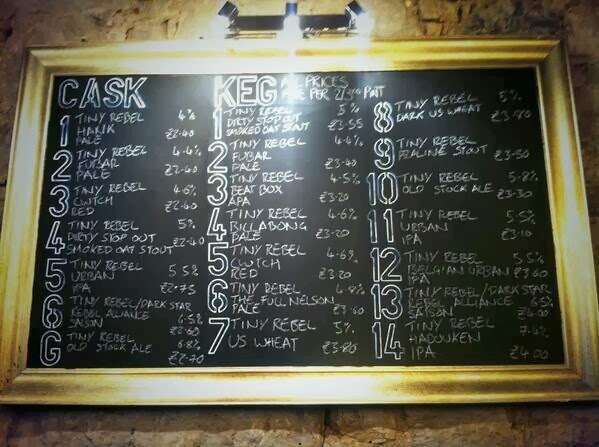 A little reading seems to indicate that it costs more to keg a beer than to put it in a cask. I'm not really sure how that can be to be honest, perhaps something to do with the kegging equipment costing more but that would only be an initial cost and not an ongoing cost surely? I believe the real reason is consumer expectation. Consumers simply expect cask beer to be cheaper, perhaps because it has a significantly shorter shelf life (a few days) compared to keg. It needs to be a high turnover product or else it goes to waste and charging the same as keg isn't likely to make the average person pick a cask ale over a kegged ale. In Ireland, cask is only now making a comeback in the last 5 years. We have gone from zero pubs serving cask ale to dozens around the country. Not many are 100% sure what they are doing and almost none have proper cellarmen capable of keeping the casks in optimum condition. To make things more difficult for the future of cask in Ireland, a premium is charged by pretty much every bar I have been to on their cask products. The average pub goer isn't going pay more for a beer that is essentially warm and flat when they can spend less money for the same beer and have it cold and fizzy. I'm not sure where the fault lies though. Maybe with the breweries or the pubs or perhaps even both. I do think something needs to change if cask is to have any real future in Ireland. It needs to be a little cheaper than the kegged version. If that means breweries cutting their costs or pubs reducing their profit margin to gain higher turnover, then that's what needs to be done. If it doesn't, the cask revival will not only fade away, it will be good riddance because all people will remember is paying a premium for a beer that was served in bad condition, probably well past its best and by bar staff who likely didn't know how to treat a cask ale in the first place. One of the few places in Ireland doing cask properly are J.W. Sweetman in Dublin. They only tend to put on cask at the weekend which means it's gone by Sunday. I don't think they charge any more for it, though I don't think they charge less either. At least the beer you get is in good condition because it's fresh but also, the on-site brewer only allows it to be sold if he is happy with it. I had one pint of cask beer in JW Sweetman. It cost me €5.70 when the same beer on keg was €4.50. It'll be a wee while before I look at the handpumps there again. Conversely, the Bull & Castle often charges less for cask: Metalman/Hardknott Yerba is currently €6 on cask and €6.50 on keg. As you say, in the UK "Consumers simply expect cask beer to be cheaper", and there's no rationale for that, it just is. The same thing happens here with stout -- people expect it to be cheaper and as a result microbrewed stout tends to be cheaper than other microbrewed beers, for no rational reason. A decision was taken, not long ago, that pale ale gets priced in the premium bracket with the lagers and ciders, not down with the stouts and macro ales. With cask, I heard from one brewer a few years ago that most Irish micros charged the same for a cask as a keg, so obviously the pub needs to charge more to get their money back from less beer. Daftness on the part of the brewery there. I agree that a more rational approach would be better, but it's up to the market to sort that out. Personally I would like to see -- for beers of normal 4 to 5% ABV strength -- that cask, keg and half-litre bottle all cost roughly the same. That would deliver real choice to the drinker. one difference with the cask pale vs keg is that it was dry hopped, which may have added a slight premium but 1.20 is excessive. Wow that was some mark up. I would guess that they see it as the market rate and it's their normal keg price that's the anomaly, which it is. It's not how any customer would view the situation, however. When 'craft keg' started being available at silly prices I moaned about how brewers were just taking advantage of novelty and niche demand to rack up the prices, and was met with a chorus of denials - there were lots of good sound technical reasons why keg just had to be more expensive than cask, and milking a new and well-heeled market had nothing to do with it. I should add that in both cases there is probably an element of brewers taking the opportunity to put the price (or the markup %) up to where they think it should have been all along. Craft brewers don't spend their days stroking white cats and cackling 'Money! Money! Mine, all mine!'. Most of them don't, anyway. I guess they will charge what they think the market will bear. It's up to punters to tell the market they will bear cheap and not put up with pricey. It will bring into sharp focus the quality of the product if there is a premium been charged. > flat when they can spend less money for the same beer and have it cold and fizzy. The average pubgoer isn't going to drink good beer at all, sadly, but If it was a beer that suited cask serving, I'd certainly choose fresh well-kept cask over keg, though not if it was "warm & flat" as that's not how any beer (IMO) should be served, cask or not. Even with the best cellar-staff, bar-staff & thirsty discerning customers, I suspect cask beer pretty much always has more beer losses in the pub than keg (so less beer to sell, so less profit). Keg washing & filling equipment historically was very expensive, but in some ways that's changed with the invention of one-way kegs that arrive at the brewery ready to fill, & most can be filled with relatively cheap equipment. The other advantage for me to cask beer is the unfiltered aspect - "filters are robbers" as one old brewer told me. AFAIK, most keg beer in the world is filtered, so it's possible they've lost some of the distinctive good flavour they might have had if they were served on cask. Filtration equipment (like kegging plant) doesn't always come cheap, so you'd expect cask to be cheaper, but nothing's that simple! As some suggest above, price is down to lots of factors, including rarity, but the biggest is probably "what can we realistically charge for this?" In The UK, craft keg beers are all the rage in beer-focussed bars & pubs & most breweries don't produce them, so there's an element of something rare, new & funky (& nothing like that fusty old man's cask beer rubbish :~D ); this seems to allow either (or both?) breweries & pubs to increase their prices, seemingly without pricing people out of the purchase. In recent weeks a local CAMRA chap Tweeted about the great value price of an excellent cask IPA & made a slight dig about craft beer bar pricing. I think it came to light that the same 7% beer in 2 pubs in the same town, was £3.30/pint on cask in one pub & £4.25 for ⅔pint in the other, so = £6.37 a pint! Now that's a price difference!